A latte war is brewing. The prize: venti-size profits in a U.S. specialty coffee market valued at $11 billion and growing. McDonald's is planning to capitalize on the public's willingness to pay $4 for a cup of coffee by hiring baristas and dropping espresso machines in 14,000 of their fast-food outlets. On the other side McDonald's Corp seems to appear burger behemoth that feeds more people every day than any other restaurant brand in the world. The company announced a national rollout of the type of made-to-order coffee drinks that Starbucks brought to the fore. Meanwhile, Starbucks, with business lagging, is fighting back with an "if you can't beat 'em, join 'em" strategy, by offering heated breakfast sandwiches and adding drive-thru windows to some of their locations. These two chains as polar opposites - one designed as a sophisticated faux living room where customers could get a decent coffee drink and read their newspapers; the other, a riot of plastic-and-vinyl booths and bright fluorescent lighting where meals are counted in billions served. Starbucks has primed the American drinking public well. McDonald's mixed coffee drinks have profit margins that rival even its regular cup of drip, an appetizing prospect in a week when shares of McDonald's fell more than 7 percent on reports of slow December sales. The company is betting its new drinks, which will be priced lower than equivalent Starbucks offerings, will also drive between-meal traffic into McDonald's restaurants. Is really possible for these two worlds to collide? If McDonald's built its own version of a grande nonfat latte, would Starbucks customers come? 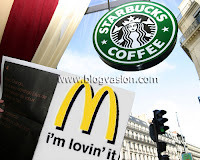 Here we’ve got some information that helps us to determine which one McDonald's or Starbucks? Visitors to Starbucks.com skew female: Starbucks' website has 8.3% more female visitors than does the McDonald's site. While McDonalds.com visitors cluster in the 18-to-34 age range, Starbucks owns the 35-to-44-year-old group. There's also a clear income gap between the two: McDonald's visitors tend to live in households earning less than $60,000 per year; Starbucks customers lean toward households earning over $60,000. The interesting point, though, is the difference in demographic trends between each restaurant's clientele over the last two years. The Big Mac customer base has remained relatively stable, while Starbucks' coffee-drinkers have diversified. It used to be that Starbucks attracted customers from a small, elite segment of the country; now, its visitors pervade many more segments across America. The strongest Starbucks and McDonald's types: For Starbucks, its segment B03, the Urban Commuter Family, described as "college-educated households containing dual income couples." These folks favor golfing as their exercise of choice. The segment that visits McDonald's is type J03, the Struggling City Centers, described as "lower-income households living in city neighborhoods in the South." The theory says that customers' habits are changing, and their eating times are changing and that’s true. But there are limits. McDonald's is developing sugar-free flavorings, but don't look for them in restaurants anytime soon. And how about the increasingly popular soy latte or green tea chai? "Not yet," says McDonald's Frick. Starbucks, take note.